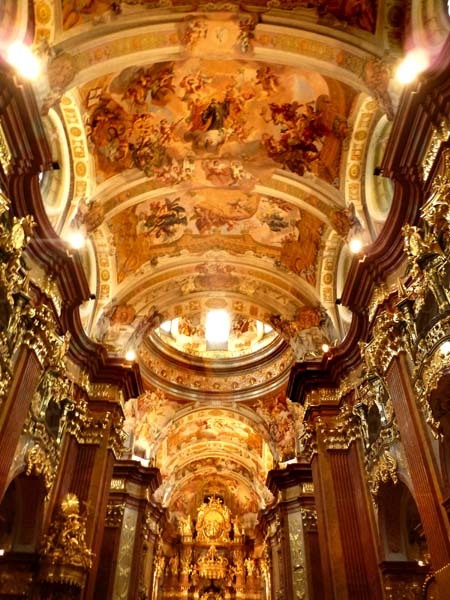 Entrance to the Benedictine Abbey in Melk, Austria (hdm). When preparing stories for the Travelogue Section, a question often arises in discussion between Lynn and me as to how much “social comment” or “opinion”, would be appropriate within the context of the story. 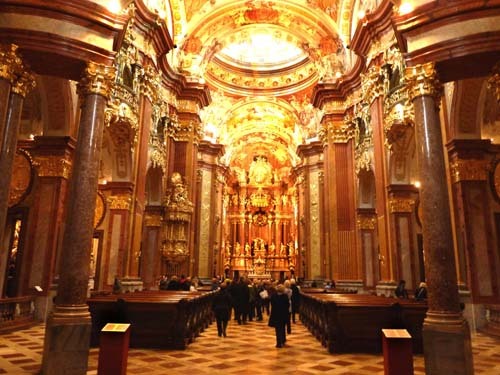 For example, when travelling through Steyr or Linz, Austria, our travel guide told a story about a 15,000 seat church built in a nearby city back in the 16th or 17th Century. 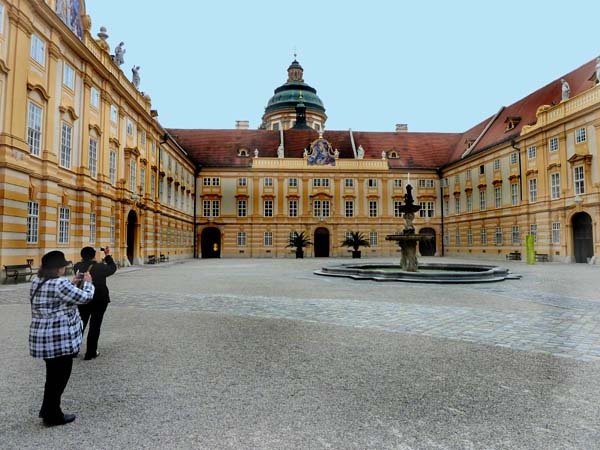 It took 70 years of sacrifice by the 20,000 residents of the city to pay for the structure as no fund assistance was forthcoming from the Monarchy (the Hapsburgs). It seemed to me that many of the poor would have dedicated their entire life toward the building of that single structure, a structure that would sit largely empty over the centuries. The building of hundreds of Churches, Abbey’s, Castles and ‘Summer Homes’, each of which exceeded the previous in grandeur, was the standard of the day. In this regard, one cannot help but be struck by the immensity of the religious and political forces that shaped and re-shaped society and which provided the absolute power needed collect the money and manpower at will. Most of the structures wre designed for the benefit of a few in the privilaged class. 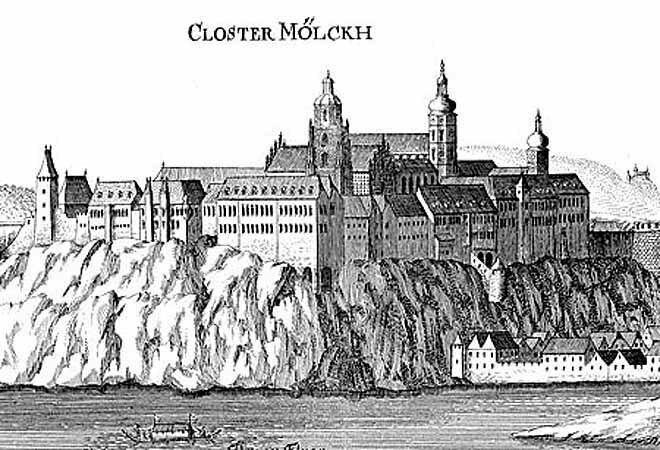 Sketch (from Web) Melk Abbey (de:Stift Melk) before its renovation by Jakob Prandtauer. The abbey was founded in 1089 when Leopold II, Margrave of Austria gave one of his castles to Benedictine monks from Lambach Abbey. 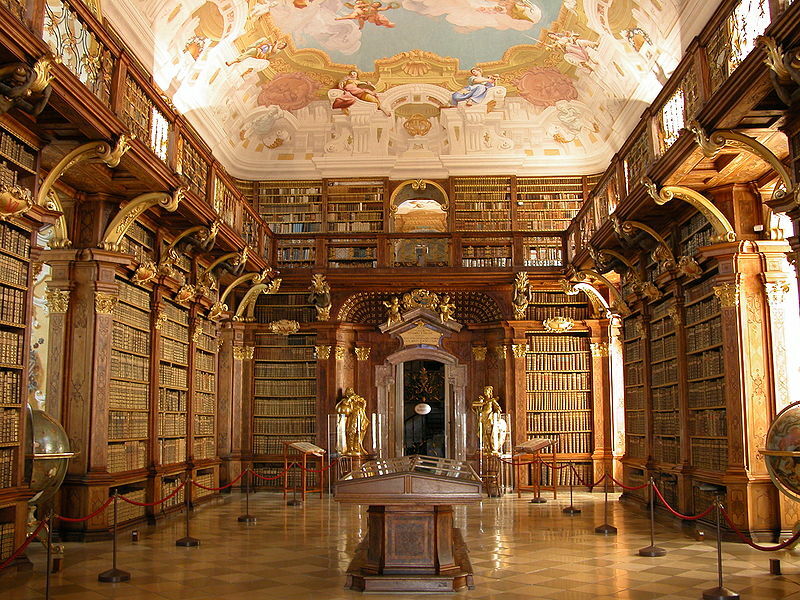 A monastic school, the Stiftsgymnasium Melk, was founded in the 12th century, and the monastic library soon became renowned for its extensive manuscript collection. The monastery’s scriptorium was also a major site for the production of manuscripts. 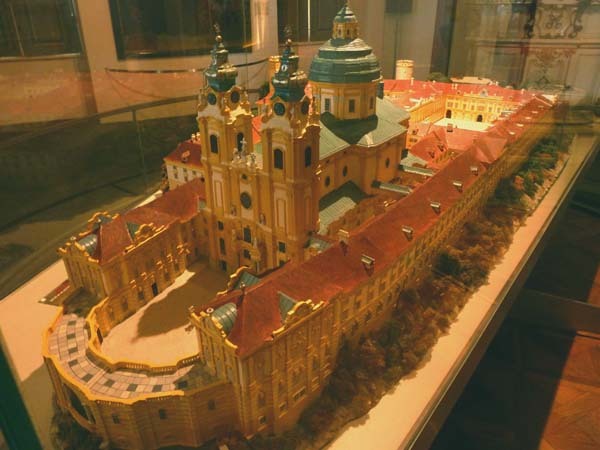 In the 15th century the abbey became the centre of the Melk Reform movement which reinvigorated the monastic life of Austria and Southern Germany (Wikipedia). The name of the Benedictine Order was derived from the name of a monk who was born much earlier, about 480 AD and 520 founded “the famous monestary of Monte Cassino, where he drew up the the orders for ‘Benedictine’ rule. This order was adapted to Western climates and demanded less austerity than had been common among Egyptian and Syrian monks. The Abbot was given great power; he was elected for life, and had (within the Rule and the limits of orthodoxy) and almost despotic control over his monks…” (Western Philosophical Thought, Bertrand Russell, p.374 ff). These vows were the basis of the rule of St. Benedict and the life of the Benedictine monks. By the tenth century the Benedictine Rule prevailed everywhere in western Europe including England. The word monk (monos) means single, and both celibacy and poverty went without saying. The Benedictine rule specified that monks should own nothing (if that is what poverty is) but this was not incorporated as a vow. In the modern understanding of Benedictine monks, poverty and celibacy are included in the vow of obedience as Benedictine monks are obedient to the rules and regulations of the order and of particular congregations and monasteries. The vows of Poverty and Celibacy were a much later addition to the thinking and rule making of the church. These are required of the later religious institutions such as Franciscans, Dominicans and Jesuits. The Benedictine Rule was already in place for 500 years before these other orders were established. The Abbey Church, the centre piece of the complex and of the Order, presents a glittering array of gold plated columns and statues, Frescos, Baroque architecture and decorative works that can only be described as stunning in their grandeur. When you first walk into the church you will need to sit for a few moments just to catch your breath and assimilate what you are seeing. As you continue from the church you will enter another room nearly as stunning, the Central Library. Book shelves, rising for thirty feet from floor to ceiling, contain some 16,000 manuscripts dating back a thousand years. Above the books is an immense Fresco. Similar rooms, filled with all forms of statues, paintings, sculptures and other precious memorabilia, are sprinkled throughout the Abbey which, over the past few hundred years, was often home to fewer than fifteen Benedictine Monks. 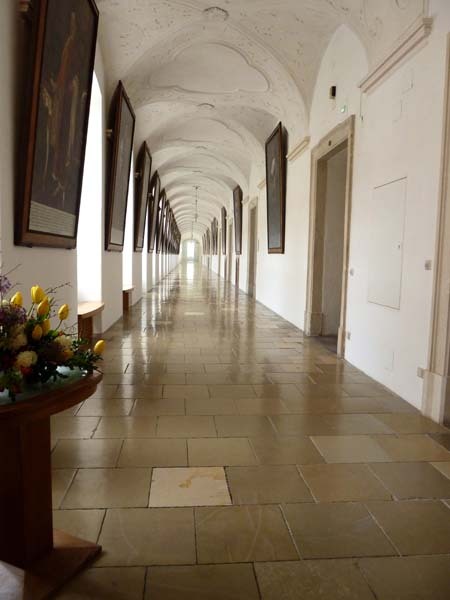 Pristine tiled hallways, one of which stretches for more than six hundred feet, connect the various sections of the complex which is situated some 130 feet above the Danube River and overlooking the city. Today, the structure is home to ten Monks and some 900 High and Junior High students in regular attendance. The following pictures provide a small glimpse into our tour. 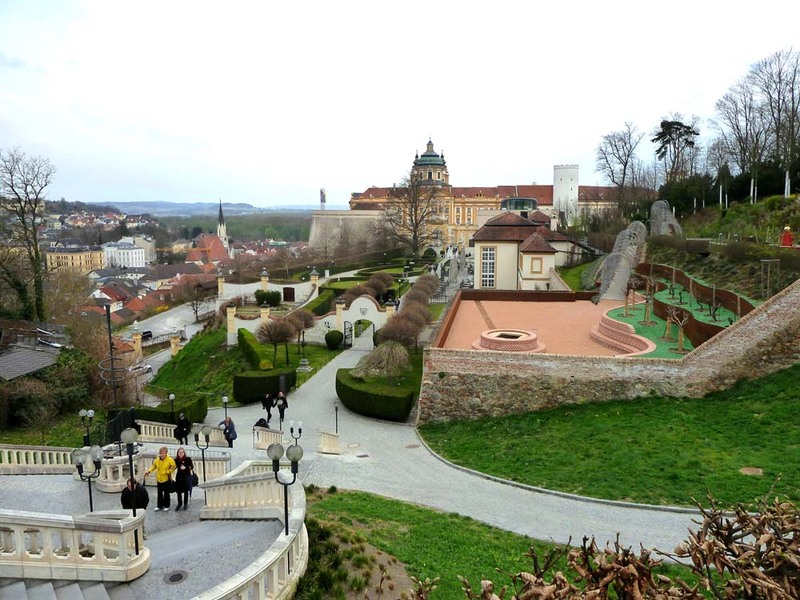 If you ever pass by Melk, make sure to spend a few hours at the Abbey. Courtyard Entry Abbey Church (hdm). 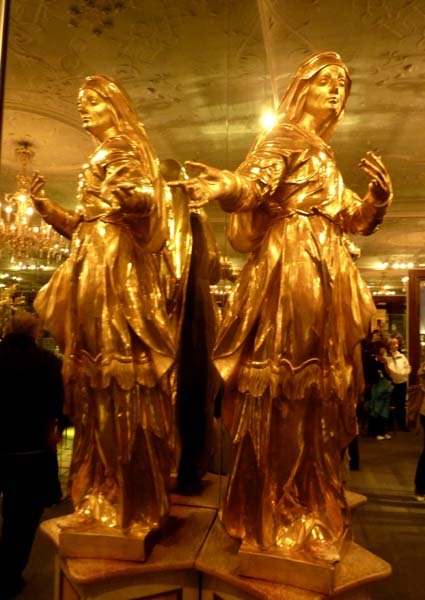 It is difficult to capture the immensity of this glittering gold, wood and marble structure. Walking forward and looking up, the full size of the Fresco became evident. It appeared to be suspended in space by gold encrusted column toppings. 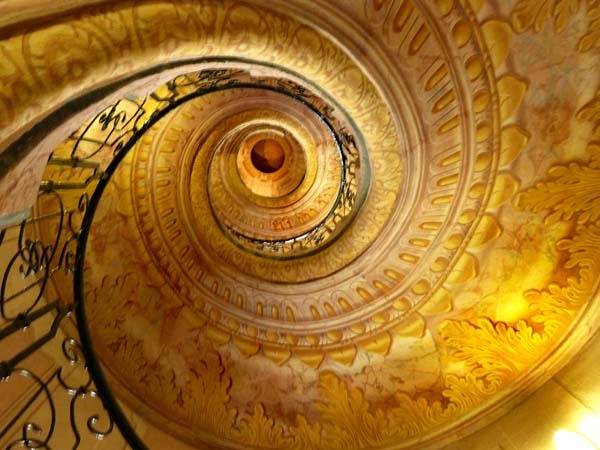 This gilded, spiril staircase is partially an optical illusion as mirrors are used to create an added sense of depth within the structure (hdm). Gilded life sized statue reflected in a glass lined wall. 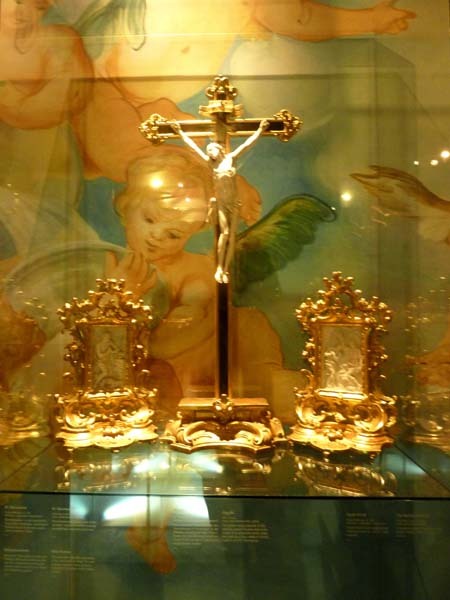 Gilded ornaments in glass enclosure. You can see the reflection of the Fresco in the glass. This gives a sense of immensity of the artwork that fills each room. 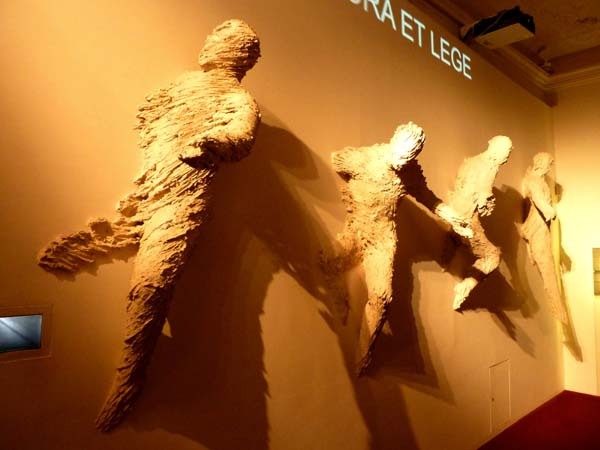 Sculptures emerging from wall. I never did figure out the meaning. This spacious room, as with many similar rooms, display large Fresco scenes in the massive coved ceilings (hdm). This is one-half of one hallway within the Abbey (turn around and it extends for an equal distance in the other direction). Each hallway is lined with priceless pieces of artwork (hdm). Photo (from Wikipedia). I could not capture a photo that properly lite the library walls and the bright Fresco ceiling. I believe Esther has a couple of photos that show the age. This photo shows only part of the some 16,000 books held within the walls of the Abbey. Glass enclosed model of the main Abbey structure. The Abbey courtyard at the far end and the Abbey Church, centre forground. Twin Abbey spires with clocks and bells taken from balcony overlooking the the Danube and Melk (next photo). 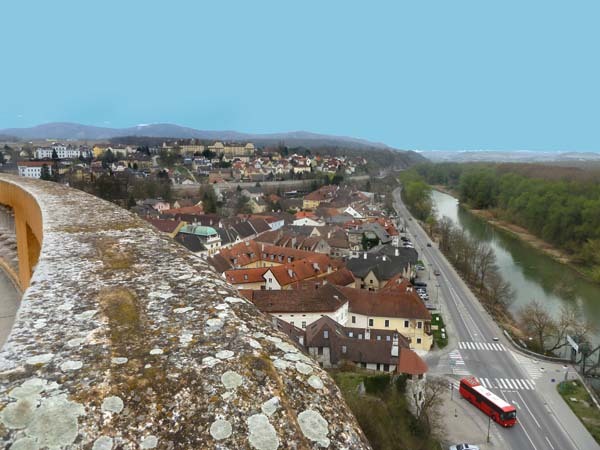 View of the Danube and Melk from the curved balcony near the entrance to the Church. We did not spend much time on the balcony as the wind came up and it turned very cold. added as an album to this post. 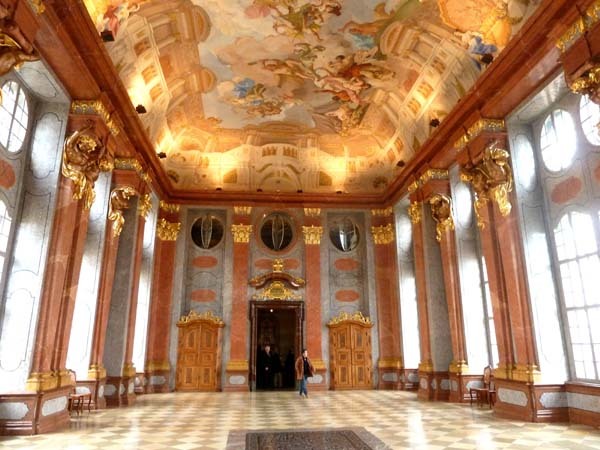 Three further posts are in the works: Vienna, Prague and a final post on considerations before booking a river cruise. It looks like only travel agents & their husband could afford to go there???? Hey Don, it certainly helps but we have long since learned that travel is something you can make almost as inexpensive as you wish, although long gone are the days of “Europe on $5,00 a Day” (remember the book?). Even at that, kids can still backpack the world within a range that is affordable to most! So,just think, if youngsters can do that, imagine what older youngsters like ourselves with all that experience can/could accomplish!